Conduct 10 completely independent experiments within a single unit. Free up bench and extraction hood space with the small foot print. Quickly navigate the simple and intuitive touch screen interface. Quickly set up and execute temperature and stirring profiles. View your results quickly and easily with the extensive data evaluation and viewing functions. Easy USB connectivity to PC or USB storage device. Out of the box to operational within 10 minutes. 10 different reaction processes can be controlled and monitored simultaneously in each of the Integrity 10 reaction cells. The temperature is controllable from - 30 to 150°C with a very high degree of accuracy and maintained by either the block itself or by using a probe in the solution. With a temperature stability of ± 0.2°C and a minimal set point overshoot of 0.1°C, extreme accuracy is guaranteed. 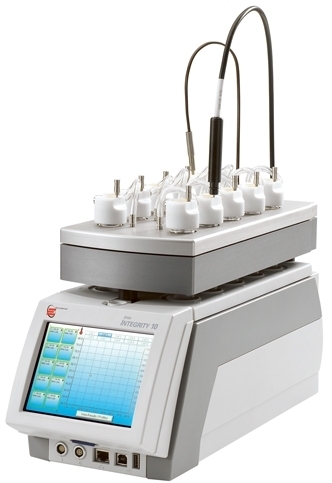 Each cell has an individually controlled magnetic stirrer and will accommodate sample volumes of between 2 and 25ml. 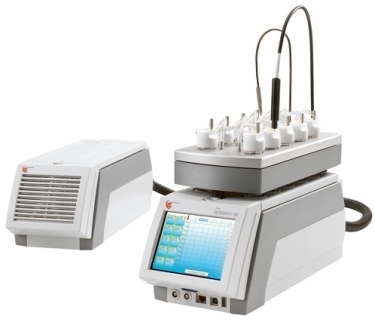 Intrusive or non-intrusive IR turbidity probes are available for the accurate determination of transitions, providing further functionality to the solubility process. Models in this range include PS200001, PS200001/X1 and PS200001/X1/X6.